Window cleaning is this one chore we all wish it could be easier. Therefore, most people call the professional property services people for the job - us. They really do make our lives easier, right? 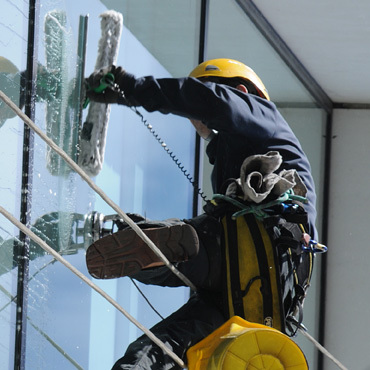 Whether there’s a house maintenance you cannot cope with in your property or should you even need the windows of a whole office building cleaned, you’d call professional property services provider, right? 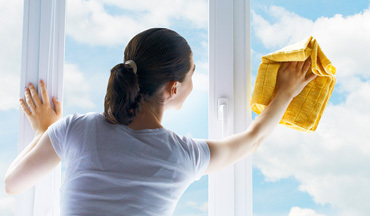 True, cleaning your windows by yourself can be quite time consuming and tedious task but most of the time it can be due to an inefficient cleaning technique. On the bright side – with just a few changes in your window cleaning routine you can quickly and easily achieve spotless windows! Most households could use a window cleaning twice a year and it will benefit greatly. Clean windows let more light inside and will make your room bright and sunny with a great view to the outside. If you don’t want to call professional property services providers or you simply want to do your cleaning yourself, don’t worry, it is still possible. Usually we just lay cloth or an old bed sheet on the floor to prevent staining on the carpets from those nasty dirty drops and that’s all. However, spending a little more effort on preparing will make the whole job a lot easier and quicker later. The first and important thing is to choose a dry and cloudy day for cleaning your windows or at least an early morning, before the sunlight comes thru them. This will allow you more time to wipe off the cleaning solution before it dries off on the glass and creates streaks. Another way to prevent streaks is to work fast. Therefore it’s better to have all your tools prepared nearby. If you have window screen, it would be better to take it off and clean it as well. You can do that by simply washing it with hot water and a soft brush. Though, if it looks like it needs more than that, dish washing liquid or vinegar should do the job. The window frames and tracks shouldn’t be neglected as well. While the frames are usually easy to clean, the tracks might be tricky. They can be cleaned easily – just put a little baking soda and vinegar on them, let the ingredients work for about 5 to 10 minutes and wipe them away. All the dirt should come off from the first attempt. A sponge brush could also be helpful for those unreachable corners. It’s recommended to wipe off the dust and dirt with a dry cloth or paper towel in order to reduce the muddy mess later, before spraying the widows with a cleaning solution. When it comes to cleaning solutions, there are a lot of those in the shops - both leading brands and bio brands are the most obvious solution. Of course, they do their job well but for those of you who are keen on DIY, here’s one more option: mix equal parts water and distilled (cider or wine) vinegar in a bucket or in a spray bottle and use it instead. The mixture could be used alone or after the window is washed with water and regular dishwashing soap, since it acts effectively against oily smudges and lime-scale build ups. However, if there are still some streaks, try combining the water, soap and vinegar together as a cleaning solution. Apart of the liquid cleaning solutions, there also are wet wipes, especially developed for windows and glass surfaces. They are easy to use, definitely won’t scratch the glass and sometimes they could leave a protective coat for several days. Free tip: Even though they most likely wouldn’t leave streaks, it’s still a good idea to wipe the window with a dry cloth after wiping it with the wet wipe. A word of caution: Be careful when dealing with special types of glass like stained glass or skylights, though. It may be better to call the professional property services guys even if it’s just for these special types of windows. Speaking of wiping the windows dry, the most popular option, of course, is the squeegee. We’ve seen professional window cleaners from the property services sector to use squeegees all the time. Although it is probably the most effective tool, it may be difficult to use if you don’t exactly know how to and it takes time to get used to it. The squeegee is the classic but it is not for everyone and if you don’t feel like using it, you might just leave it to the professional property service providers. Should you yet decide to use a squeegee, make sure to wipe its rubber blade after each stroke with paper towel. What’s more, if you always struggle to figure out if the streaks are from the inside or from the outside of the window, you may start using sideways strokes on one side of the glass and up-and-down strokes on the other. This will save you the window cleaner’s essential eye-for-detail and will be easy to note on which side they are. Are there any other ways to wipe off the cleaning solution from your windows that are still going to give you brilliant results? Yes! Does every type of cloth work just as well as the others? Not really. Regular cotton towels are not a good idea because they leave lint behind all over the glass. You can use a lint-free cloth like microfiber or chamois instead. Alternatively, you could also use paper towel or even black-and-white newspaper. Newspaper really does give the glass this beautiful polished look and using it for window cleaning is a really good recycling option. However, it may leave ink stains on your hands. If you’re using a mop to clean your windows, here’s a tip – use a U-shaped telescopic pole for the hard to reach windows, especially on the higher floors. With it, you’ll no longer need to hang from the window in order to reach the external part of it. If you haven’t heard of such before or have no idea how to use it, you can always book professional property service providers – they might have high reach and wash telescopic poles (we have a few for certain). There are some residential areas where the windows might get very dirty on the external side of windows due to pollution or other. Should this be you case, consider using two different window cleaning tools for both sides – external and internal, of your windows. This will prevent bringing inside the nasty dirt from outside. Second bucket could also be beneficial or simply clean the external part of all your windows and you may then continue with the internal window cleaning. We live in the era of technological development and naturally, there are some tech gadgets that could make window cleaning an easier job. Did you know that there are robots that can clean windows? They aren’t the most popular choice but there are several brands on the market like Winbot, for example. With every new model they become more reliable, quieter and easier to use. Perhaps they could replace the good old professional property services in the future? Another manually controlled gadget is the magnetic window cleaner. With it you could clean both sides of your window at the same time. However, it still has some faults to its design since moving quickly will make the magnets lose contact. How to prevent windows from becoming too difficult to clean? Taping Christmas lights or those lovely pictures created by your little artists on your windows may be atmospheric but the tape will surely leave some glue residue behind on the glass. Now, this is not easy to clean and scraper blades might come handy here. Important note: Scraper blades are not a toy to play with and sometimes the price to pay is damaged windows. Generally, sticking or taping things on you windows may give you a hard time later when cleaning them. You could also protect your windows and window frames by covering them while painting the walls, which will also eliminate the risk of using scraper blades later to remove paint marks. Remember, safety first, never hang from windows. Rather call the professional property service providers than risk your health. Now you know enough to start your spring time window cleaning! After the job is done you’ll be rewarded with bright and sunny rooms with a great view overlooking to your garden or the world’s capital!